Discuss different types of fission and thermonuclear bombs. Explain the ill effects of nuclear explosion. The world was in turmoil when fission was discovered in 1938. The discovery of fission, made by two German physicists, Otto Hahn and Fritz Strassman, was quickly verified by two Jewish refugees from Nazi Germany, Lise Meitner and her nephew Otto Frisch. Fermi, among others, soon found that not only did neutrons induce fission; more neutrons were produced during fission. The possibility of a self-sustained chain reaction was immediately recognized by leading scientists the world over. The enormous energy known to be in nuclei, but considered inaccessible, now seemed to be available on a large scale. Within months after the announcement of the discovery of fission, Adolf Hitler banned the export of uranium from newly occupied Czechoslovakia. It seemed that the military value of uranium had been recognized in Nazi Germany, and that a serious effort to build a nuclear bomb had begun. Alarmed scientists, many of them who fled Nazi Germany, decided to take action. None was more famous or revered than Einstein. It was felt that his help was needed to get the American government to make a serious effort at nuclear weapons as a matter of survival. Leo Szilard, an escaped Hungarian physicist, took a draft of a letter to Einstein, who, although pacifistic, signed the final version. The letter was for President Franklin Roosevelt, warning of the German potential to build extremely powerful bombs of a new type. It was sent in August of 1939, just before the German invasion of Poland that marked the start of World War II. It was not until December 6, 1941, the day before the Japanese attack on Pearl Harbor, that the United States made a massive commitment to building a nuclear bomb. The top secret Manhattan Project was a crash program aimed at beating the Germans. It was carried out in remote locations, such as Los Alamos, New Mexico, whenever possible, and eventually came to cost billions of dollars and employ the efforts of more than 100,000 people. J. Robert Oppenheimer (1904–1967), whose talent and ambitions made him ideal, was chosen to head the project. The first major step was made by Enrico Fermi and his group in December 1942, when they achieved the first self-sustained nuclear reactor. This first “atomic pile”, built in a squash court at the University of Chicago, used carbon blocks to thermalize neutrons. It not only proved that the chain reaction was possible, it began the era of nuclear reactors. Glenn Seaborg, an American chemist and physicist, received the Nobel Prize in physics in 1951 for discovery of several transuranic elements, including plutonium. Carbon-moderated reactors are relatively inexpensive and simple in design and are still used for breeding plutonium, such as at Chernobyl, where two such reactors remain in operation. Plutonium was recognized as easier to fission with neutrons and, hence, a superior fission material very early in the Manhattan Project. Plutonium availability was uncertain, and so a uranium bomb was developed simultaneously. 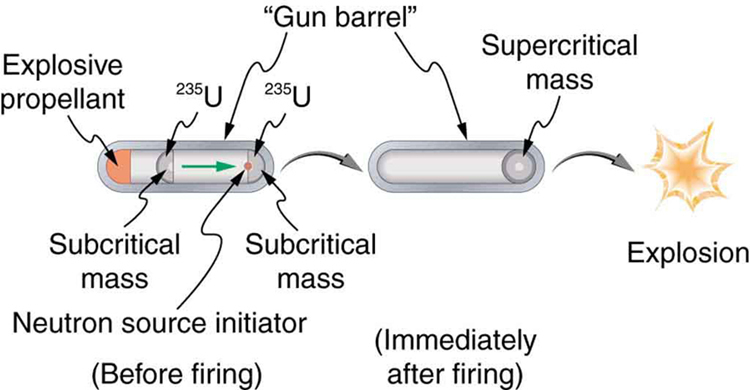 Figure 1 shows a gun-type bomb, which takes two subcritical uranium masses and blows them together. To get an appreciable yield, the critical mass must be held together by the explosive charges inside the cannon barrel for a few microseconds. Since the buildup of the uranium chain reaction is relatively slow, the device to hold the critical mass together can be relatively simple. Owing to the fact that the rate of spontaneous fission is low, a neutron source is triggered at the same time the critical mass is assembled. Figure 1. A gun-type fission bomb for 235U utilizes two subcritical masses forced together by explosive charges inside a cannon barrel. The energy yield depends on the amount of uranium and the time it can be held together before it disassembles itself. Plutonium’s special properties necessitated a more sophisticated critical mass assembly, shown schematically in Figure 2. A spherical mass of plutonium is surrounded by shape charges (high explosives that release most of their blast in one direction) that implode the plutonium, crushing it into a smaller volume to form a critical mass. The implosion technique is faster and more effective, because it compresses three-dimensionally rather than one-dimensionally as in the gun-type bomb. Again, a neutron source must be triggered at just the correct time to initiate the chain reaction. Figure 2. An implosion created by high explosives compresses a sphere of 239Pu into a critical mass. The superior fissionability of plutonium has made it the universal bomb material. Owing to its complexity, the plutonium bomb needed to be tested before there could be any attempt to use it. 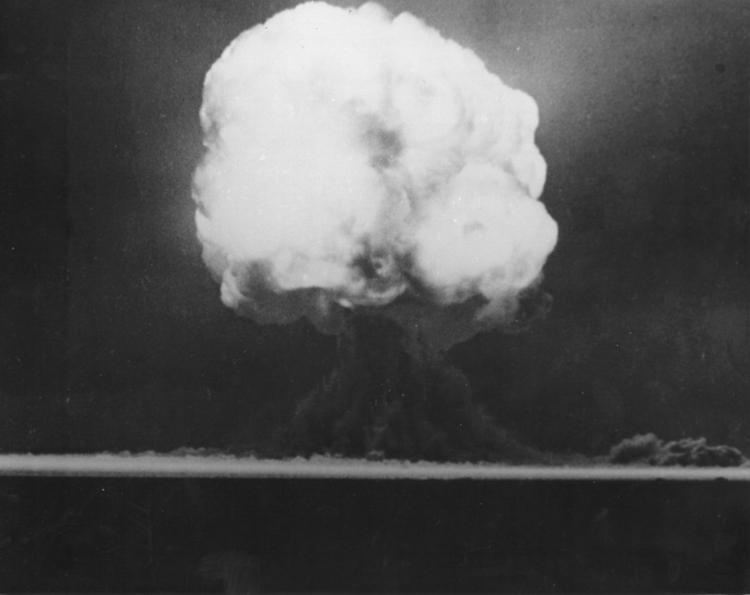 On July 16, 1945, the test named Trinity was conducted in the isolated Alamogordo Desert about 200 miles south of Los Alamos (see Figure 3). A new age had begun. The yield of this device was about 10 kilotons (kT), the equivalent of 5000 of the largest conventional bombs. Although Germany surrendered on May 7, 1945, Japan had been steadfastly refusing to surrender for many months, forcing large casualties. Invasion plans by the Allies estimated a million casualties of their own and untold losses of Japanese lives. The bomb was viewed as a way to end the war. The first was a uranium bomb dropped on Hiroshima on August 6. Its yield of about 15 kT destroyed the city and killed an estimated 80,000 people, with 100,000 more being seriously injured (see Figure 4). The second was a plutonium bomb dropped on Nagasaki only three days later, on August 9. 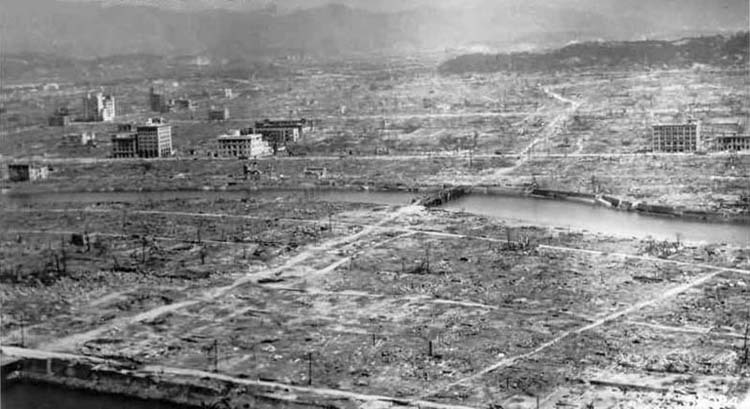 Its 20 kT yield killed at least 50,000 people, something less than Hiroshima because of the hilly terrain and the fact that it was a few kilometers off target. The Japanese were told that one bomb a week would be dropped until they surrendered unconditionally, which they did on August 14. In actuality, the United States had only enough plutonium for one more and as yet unassembled bomb. Knowing that fusion produces several times more energy per kilogram of fuel than fission, some scientists pushed the idea of a fusion bomb starting very early on. Calling this bomb the Super, they realized that it could have another advantage over fission—high-energy neutrons would aid fusion, while they are ineffective in fission. Thus the fusion bomb could be virtually unlimited in energy release. The first such bomb was detonated by the United States on October 31, 1952, at Eniwetok Atoll with a yield of 10 megatons (MT), about 670 times that of the fission bomb that destroyed Hiroshima. The Soviets followed with a fusion device of their own in August 1953, and a weapons race, beyond the aim of this text to discuss, continued until the end of the Cold War. Figure 5 shows a simple diagram of how a thermonuclear bomb is constructed. A fission bomb is exploded next to fusion fuel in the solid form of lithium deuteride. Before the shock wave blows it apart, rays heat and compress the fuel, and neutrons create tritium through the reaction . Additional fusion and fission fuels are enclosed in a dense shell of . The shell reflects some of the neutrons back into the fuel to enhance its fusion, but at high internal temperatures fast neutrons are created that also cause the plentiful and inexpensive to fission, part of what allows thermonuclear bombs to be so large. Figure 5. 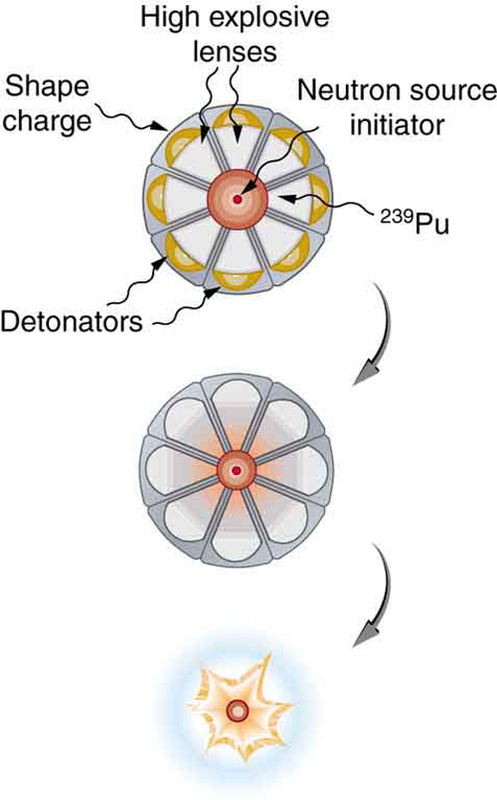 This schematic of a fusion bomb (H-bomb) gives some idea of how the 239Pu fission trigger is used to ignite fusion fuel. Neutrons and γ rays transmit energy to the fusion fuel, create tritium from deuterium, and heat and compress the fusion fuel. 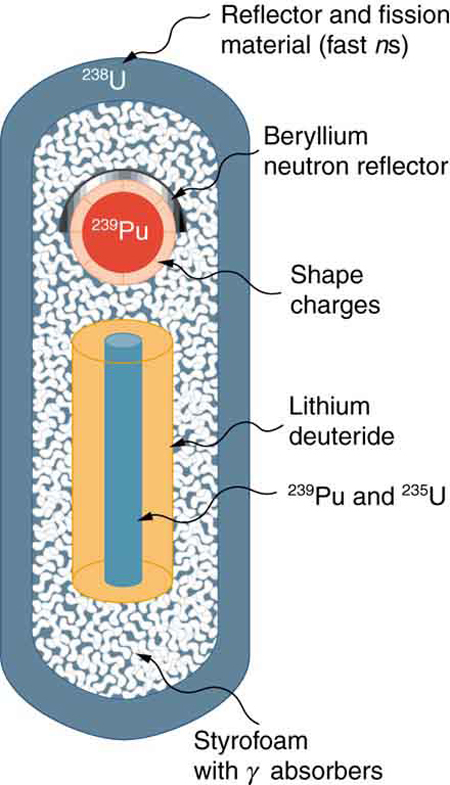 The outer shell of 238U serves to reflect some neutrons back into the fuel, causing more fusion, and it boosts the energy output by fissioning itself when neutron energies become high enough. The energy yield and the types of energy produced by nuclear bombs can be varied. Energy yields in current arsenals range from about 0.1 kT to 20 MT, although the Soviets once detonated a 67 MT device. Nuclear bombs differ from conventional explosives in more than size. Figure 6 shows the approximate fraction of energy output in various forms for conventional explosives and for two types of nuclear bombs. Nuclear bombs put a much larger fraction of their output into thermal energy than do conventional bombs, which tend to concentrate the energy in blast. Another difference is the immediate and residual radiation energy from nuclear weapons. This can be adjusted to put more energy into radiation (the so-called neutron bomb) so that the bomb can be used to irradiate advancing troops without killing friendly troops with blast and heat. Figure 6. Approximate fractions of energy output by conventional and two types of nuclear weapons. In addition to yielding more energy than conventional weapons, nuclear bombs put a much larger fraction into thermal energy. This can be adjusted to enhance the radiation output to be more effective against troops. An enhanced radiation bomb is also called a neutron bomb. At its peak in 1986, the combined arsenals of the United States and the Soviet Union totaled about 60,000 nuclear warheads. In addition, the British, French, and Chinese each have several hundred bombs of various sizes, and a few other countries have a small number. Nuclear weapons are generally divided into two categories. Strategic nuclear weapons are those intended for military targets, such as bases and missile complexes, and moderate to large cities. There were about 20,000 strategic weapons in 1988. Tactical weapons are intended for use in smaller battles. Since the collapse of the Soviet Union and the end of the Cold War in 1989, most of the 32,000 tactical weapons (including Cruise missiles, artillery shells, land mines, torpedoes, depth charges, and backpacks) have been demobilized, and parts of the strategic weapon systems are being dismantled with warheads and missiles being disassembled. According to the Treaty of Moscow of 2002, Russia and the United States have been required to reduce their strategic nuclear arsenal down to about 2000 warheads each. A few small countries have built or are capable of building nuclear bombs, as are some terrorist groups. Two things are needed—a minimum level of technical expertise and sufficient fissionable material. The first is easy. Fissionable material is controlled but is also available. There are international agreements and organizations that attempt to control nuclear proliferation, but it is increasingly difficult given the availability of fissionable material and the small amount needed for a crude bomb. The production of fissionable fuel itself is technologically difficult. However, the presence of large amounts of such material worldwide, though in the hands of a few, makes control and accountability crucial. There are two types of nuclear weapons—fission bombs use fission alone, whereas thermonuclear bombs use fission to ignite fusion. Both types of weapons produce huge numbers of nuclear reactions in a very short time. Energy yields are measured in kilotons or megatons of equivalent conventional explosives and range from 0.1 kT to more than 20 MT. Nuclear bombs are characterized by far more thermal output and nuclear radiation output than conventional explosives. 1: What are some of the reasons that plutonium rather than uranium is used in all fission bombs and as the trigger in all fusion bombs? 3: How does the lithium deuteride in the thermonuclear bomb shown in Figure 5 supply tritium ( ) as well as deuterium ( )? 4: Fallout from nuclear weapons tests in the atmosphere is mainly and , which have 28.6- and 32.2-y half-lives, respectively. Atmospheric tests were terminated in most countries in 1963, although China only did so in 1980. It has been found that environmental activities of these two isotopes are decreasing faster than their half-lives. Why might this be? 1: Find the mass converted into energy by a 12.0-kT bomb. 2: What mass is converted into energy by a 1.00-MT bomb? 3: Fusion bombs use neutrons from their fission trigger to create tritium fuel in the reaction . What is the energy released by this reaction in MeV? 4: It is estimated that the total explosive yield of all the nuclear bombs in existence currently is about 4,000 MT. (a) Convert this amount of energy to kilowatt-hours, noting that . (b) What would the monetary value of this energy be if it could be converted to electricity costing 10 cents per kW·h? 5: A radiation-enhanced nuclear weapon (or neutron bomb) can have a smaller total yield and still produce more prompt radiation than a conventional nuclear bomb. This allows the use of neutron bombs to kill nearby advancing enemy forces with radiation without blowing up your own forces with the blast. For a 0.500-kT radiation-enhanced weapon and a 1.00-kT conventional nuclear bomb: (a) Compare the blast yields. (b) Compare the prompt radiation yields. 6: (a) How many nuclei must fission to produce a 20.0-kT yield, assuming 200 MeV per fission? (b) What is the mass of this much ? 7: Assume one-fourth of the yield of a typical 320-kT strategic bomb comes from fission reactions averaging 200 MeV and the remainder from fusion reactions averaging 20 MeV. (a) Calculate the number of fissions and the approximate mass of uranium and plutonium fissioned, taking the average atomic mass to be 238. (b) Find the number of fusions and calculate the approximate mass of fusion fuel, assuming an average total atomic mass of the two nuclei in each reaction to be 5. (c) Considering the masses found, does it seem reasonable that some missiles could carry 10 warheads? Discuss, noting that the nuclear fuel is only a part of the mass of a warhead. 8: This problem gives some idea of the magnitude of the energy yield of a small tactical bomb. Assume that half the energy of a 1.00-kT nuclear depth charge set off under an aircraft carrier goes into lifting it out of the water—that is, into gravitational potential energy. How high is the carrier lifted if its mass is 90,000 tons? 9: It is estimated that weapons tests in the atmosphere have deposited approximately 9 MCi of on the surface of the earth. Find the mass of this amount of . 10: A 1.00-MT bomb exploded a few kilometers above the ground deposits 25.0% of its energy into radiant heat. (a) Find the calories per at a distance of 10.0 km by assuming a uniform distribution over a spherical surface of that radius. (b) If this heat falls on a person’s body, what temperature increase does it cause in the affected tissue, assuming it is absorbed in a layer 1.00-cm deep? (a) What would the average electrical power output be? (b) How many years would the arsenal last at this rate? 5: (a) Blast yields to , or 2.5 to 1, conventional to radiation enhanced. (b) Prompt radiation yields to , or 3 to 1, radiation enhanced to conventional. (c) The nuclear fuel totals only 6 kg,so it is quite reasonable that some missiles carry 10 overheads. The mass of the fuel would only be 60 kg and therefore the mass of the 10 warheads, weighing about 10 times the nuclear fuel, would be only 1500 lbs. If the fuel for the missiles weighs 5 times the total weight of the warheads, the missile would weigh about 9000 lbs or 4.5 tons. This is not an unreasonable weight for a missile. 32.7 Nuclear Weapons by OpenStax is licensed under a Creative Commons Attribution 4.0 International License, except where otherwise noted.